If, for whatever reason, the modern world is grinding you down and you find yourself pining for some idealized time in the past, let me give you something to hold onto to make you feel better: in at least the arena of electric cars, the past was a shithole. The modern world is doing wonderfully with electric cars, and you won’t believe the crap we had to deal with back in the day. Sure, we give Tesla a good amount of guff for a lot of things, most recently their about how they’re building the new Model 3s (slowly, by hand), but the truth is every electric car currently available is like the automotive equivalent of a god compared to what we had in the 1970s and 1980s. Take the Marathon C-300, for example. Marathon was a Canadian company that made golf carts and other utility vehicles before they decided the time was right for them to make a general-use passenger car. The Marathon C-300 was a fiberglass-bodied two seat convertible that looked an awful lot like a Volkswagen Thing, or perhaps a Citroën Mehari. It had a soft top and soft, Jeep-like doors, and used parts from a variety of sources, with a transmission and rear axle coming from a Pinto, and a using the same Eberspacher gas heater that VW used. The basic look and construction of the C-300 aren’t the bad parts, though. Things get amazing when you get to the specs. The C-300 used twelve deep-cycle six-volt batteries, powering a 72-volt 8 horsepower DC motor. That 8 hp monster was good enough to give the 2300 lb car a breathtaking cruising speed of 35 MPH, and a range of about 50 miles. Wow. Every one of those numbers is somehow more depressing than the last. Just a reminder, even the worst mainstream electric cars available now have at least twice the range, over twice the top speed, and about twelve or more times the power. And aren’t built like a paddleboat. Marathon must have been pretty optimistic about the demand for their car, because in addition to their Montreal factory, a second factory was set up in South Carolina to cater to the expected demand in America. Who, exactly, would be demanding these cars is a fascinating question, but I think I have a pretty good idea of who the ideal target customer for a Marathon C-300 would be: someone who really wants a VW Thing, but would really prefer one with 1/6th the power, and a two-gallon gas tank. Oh, and a bit less than half the top speed, too. I mean, a stock VW Thing made nearly 50 terrifying horsepower, and a full tank could have given one a range of something approaching 300 miles! Think of all the potential for trouble in a vehicle with that much power, and capable of going that far? That kind of speed and distance sounds like a recipe for debauchery and ruin. No thank you! 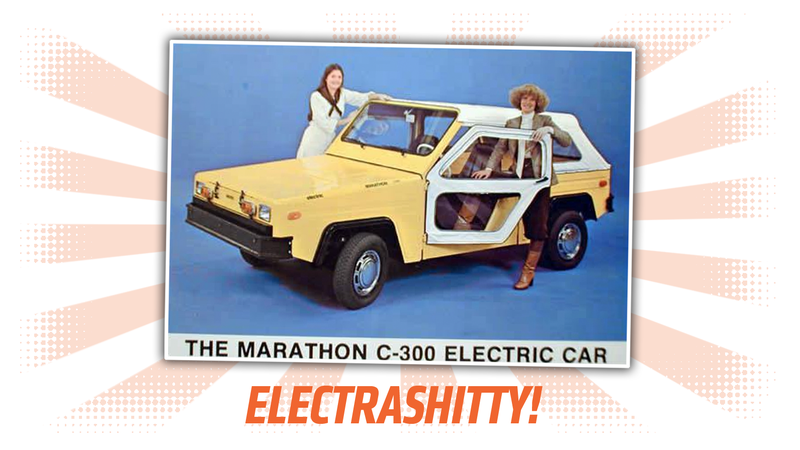 Amazingly, in the late ‘70s and early ‘80s, an electric car like the Marathon C-300 wasn’t considered all that terrible. A number of these were built, and it seems even sold, between 1977 and 1980. The U.S. Park Service even had one. Just think about that. So, at least when it comes to electric cars, the present really isn’t so bad. Enjoy it!